Divide goat cheese filling into 6 equal portions; set aside. 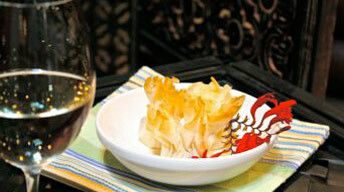 Cut phyllo sheets into quarters, then trim to create even squares. Cover with a lightly damp towel. Place one phyllo square on a worktable. Brush lightly with butter, and place another square on top and slightly off-set from the bottom square; brush with butter. Repeat the process with a third square of phyllo, brushing with butter. Place one portion of filling in the center of buttered phyllo stack. Bring each corner of the square up to meet in the center; pinch to seal. Place on a baking sheet. Repeat the process to make 5 more bundles. Refrigerate for at least 30 minutes or overnight. Preheat an oven to 400°F. Bake bundles on center rack of the oven for 4-5 minutes, or until the phyllo is golden brown. Serve as an appetizer or along side a simple green salad. Heat a small sauté pan over medium heat; drizzle in oil. Add onion; sauté until lightly browned, about 2 minutes. Add garlic and pepper flakes; sauté 1-2 minutes more. Stir in roasted pepper; cook for 1 more minute. Transfer to medium bowl; set aside to cool completely. Add goat cheese and basil to sauteed vegetables; mix well. Season to taste with salt and pepper. Chill until ready to use.